Chandra Shekhar Azad ( /t͡ʃʌnd̪ɾʌːɑːd/; sometimes also spelled Chandrasekhar; 23 July 1906 – 27 February 1931), popularly known as by his self-taken name Azad ("The Free"), was an Indian revolutionary who reorganised the Hindustan Republican Association under its new name of Hindustan Socialist Republican Army (HSRA) after the death of its founder, Ram Prasad Bismil, and three other prominent party leaders, Roshan Singh, Rajendra Nath Lahiri and Ashfaqulla Khan. He often used the pseudonym "Balraj" when signing pamphlets issued as the commander in chief of the HSRA (Hindustan Socialist Republic Army). Azad was born as Chandrashekhar Tiwari on 23 July 1906 in Bhavra village, in the present-day Alirajpur district of Madhya Pradesh. His forefathers were from Badarka village near Kanpur (in present-day Unnao District). His mother, Jagrani Devi Tiwari , was the third wife of Sitaram Tiwari, whose previous wives had died young. After the birth of their first son, Sukhdev Tiwari, in Badarka, the family moved to Alirajpur State. After suspension of the non-cooperation movement in 1922 by Gandhi, Azad became more aggressive. He met a young revolutionary, Manmathnath Gupta, who introduced him to Ram Prasad Bismil who had formed the Hindustan Republican Association (HRA), a revolutionary organisation. He then became an active member of the HRA and started to collect funds for HRA. Most of the fund collection was through robberies of government property. He was involved in the Kakori Train Robbery of 1925, in the attempt to blow up the Viceroy of India's train in 1926, and at last the shooting of J. P. Saunders at Lahore in 1928 to avenge the killing of Lala Lajpat Rai. Azad made Jhansi his organisation's hub for some time. He used the forest of Orchha, situated 15 kilometres (9.3 mi) from Jhansi, as a site for shooting practice and, being an expert marksman, he trained other members of his group. He built a hut near to a Hanuman temple on the banks of the Satar River and lived there under the alias of Pandit Harishankar Brahmachari for a long period. He taught children from the nearby village of Dhimarpura (now renamed Azadpura by the Government of Madhya Pradesh) and thus managed to establish good rapport with the local residents. The Hindustan Republican Association (HRA) was formed by Bismil, Chatterji, Sachindra Nath Sanyal and Shachindra Nath Bakshi in 1924. In the aftermath of the Kakori train robbery in 1925, the British clamped down on revolutionary activities. Prasad, Ashfaqulla Khan, Thakur Roshan Singh and Rajendra Nath Lahiri were sentenced to death for their participation. Azad, Keshab Chakravarthy and Murari Sharma evaded capture. 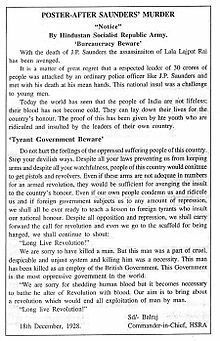 Chandra Shekhar Azad later reorganised the HRA with the help of revolutionaries like Sheo Verma and Mahaveer Singh. Azad and Bhagat Singh secretly reorganised the HRA as the HSRA in September 1928. so as to achieve their primary aim of an independent India based on socialist principle. The insight of his revolutionary activities are described by Manmath Nath Gupt a fellow member of HSRA in his numerous writings. Gupta has also written his biography titled "Chandrashekhar Azad" and in his book History of the Indian Revolutionary Movement (English version of above: 1972) he gave a deep insight about the activities of Azad and the ideology of Azad and HSRA. Azad died at Alfred Park in Allahabad on 27 February 1931. The police surrounded him in the park after an unknown informant told them he was there. He was wounded in the process of defending himself and Sukhdev Raj (not to be confused with Sukhdev Thapar) and killed three policemen and wounded some others. His actions made it possible for Sukhdev Raj to escape. After a long shootout, holding true to his pledge to never be captured alive, he shot himself dead with his last bullet. The Colt pistol of Chandra Shekhar Azad is displayed at the Allahabad Museum. Starting from Manoj Kumar's 1965 film Shaheed, many films have featured the character of Azad. Manmohan played Azad in the 1965 film, Sunny Deol portrayed Azad in the movie 23rd March 1931: Shaheed, Azad was portrayed by Akhilendra Mishra in The Legend of Bhagat Singh and Raj Zutshi portrayed Azad in Shaheed-E-Azam. The 2018 television mini-series Chandrashekhar chronicles the life of Chandra Shekhar Azad from his childhood to legendary revolutionary leader. In the series young Chandrashekar Aazd was portrayed by Ayaan Zubair, Azad in his teens by Dev Joshi and Adult Azad by Karan Sharma. ^ Bhawan Singh Rana (1 January 2005). Chandra Shekhar Azad (An Immortal Revolutionary Of India). Diamond Pocket Books (P) Ltd. p. 10. ISBN 978-81-288-0816-6. Retrieved 11 September 2012. ^ "MMahatma Gandhi tried his best to save Bhagat Singh". The Quint. Retrieved 4 September 2018. ^ The Calcutta review. University of Calcutta. Dept. of English. 1958. p. 44. Retrieved 11 September 2012. ^ Catherine B. Asher, ed. (June 1994). India 2001: reference encyclopedia. South Asia Publications. p. 131. ISBN 978-0-945921-42-4. Retrieved 11 September 2012. ^ Rana, Bhawan Singh (2005). Chandra Shekhar Azad (An Immortal Revolutionary of India). Diamond Pocket Books. pp. 22–24. ISBN 9788128808166. ^ Mittal, S. K.; Habib, Irfan (June 1982). "The Congress and the Revolutionaries in the 1920s". Social Scientist. 10 (6): 20–37. JSTOR 3517065. ^ Habib, Irfan (September 1997). "Civil Disobedience 1930–31". Social Scientist. 25 (9/10): 43–66. doi:10.2307/3517680. JSTOR 3517680. (Subscription required (help)). ^ Bhattacherje, S. B. (1 May 2009). Encyclopaedia of Indian Events & Dates. Sterling Publishers Pvt. Ltd. pp. B–19. ISBN 9788120740747. Retrieved 24 March 2014. ^ a b Khatri, Ram Krishna (1983). Shaheedon Ki Chhaya Mein. Nagpur: Vishwabharati Prakashan. pp. 138–139. ^ Is The Indian Script Unique. YouTube. Film Writers Association. 13 April 2012. Event occurs at 23:34. Retrieved 1 August 2016. ^ "This peace is the result of the sacrifice of freedom fighters like Azad: Ayaan Zubair". The Times of India. 31 March 2018. Wikimedia Commons has media related to Chandra Shekhar Azad.